Kids in the neighborhood are gearing up for fall soccer tryouts and preseason football is on TV. Fall is on it’s way which means the start of another school year is just around the corner. For my family, it means digging out of the school drawer the list of supplies needed for our high school freshman. 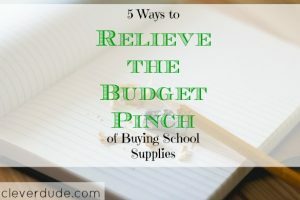 School supplies can really put a pinch on a family’s pocketbook, however, over the years my wife and I have learned some ways to minimize the pain of that pinch. Start early: My wife and I used head to the store mid-August and pick up all of the supplies all in one shot at a single location. The schools in our district actually send home the list of needed supplies for the next grade on the last day of school in the spring. If we start looking for sales in June, we have all summer to find the best deals possible. Spreading it out: Purchasing all the school supplies at once can add up to a significant amount of money. Last year, supplies added up to almost $50. It will most likely end up being higher this year given our son is now in high school. By starting early, it allows us to spread the overall cost over a longer period of time, impacting every single month’s budget a little less. Look Everywhere: I was walking through a hardware store when I came across a â€œBack To Schoolâ€ section. Everything was on sale, and everything had a rebate. Scour those ads that come in the mail, look for school supplies even in the most unlikely places and you’ll may be surprised what you find and where you find it. Buy Quality: We used to buy cheap, cardboard folders that would rip half way through the year. Now we buy the plastic folders and put a removable sticker on the front to label it’s use for the year. These folders may cost a little more, but they are almost indestructible and we’ve been using some of these folders for several years. We also used to purchase â€œcharacterâ€ backpacks having the design of our son’s favorite TV show at the time. Always overpriced, and made poorly, these backpacks never made it through a full school year. Our son will need a new backpack this year, as the one he had been using for the last 4 years finally broke. Combine with other families: During this year’s round of school supply shopping I found a package of 10 block erasers at a very reasonable cost per eraser, but I didn’t need 10. Combining forces with my neighbors, we split the cost of the erasers (and several other multi item packs) and created our own sale! By the time school starts our son will be fully stocked with new supplies and ready for another successful school year. Using these tips, buying needed school supplies are barely a blip on our budget radar. How do you make school supply shopping as easy on the budget as possible? Our children’s new school requires a USB stick each. Check with companies you do business with for freebies they give out as swag to customers. They are usually small, but more than adequate for storing school documents. Not a tip – we too have found that forking over the money up front for a good backpack rather than the flavor of the month is worth it in the long run. We prefer the Wenger ones as they seem to last and usually have tech pockets (kids actually get my hand-downs). Do you have any to suggest specifically? @Dan – I think the USB requirement is new, but going to become more common. It’s officially listed as “optional” for us right now, but my son uses it a ton. The nice thing is they are relatively in expensive if you can’t find one for free. As far as backpack brands, the one he used for the last few years was an Eddie Bauer. But the one we just bought was EastPak – and like you said it does have a tech pocket.